Lock in a great price for Hôtel Confort – rated 8.8 by recent guests! Our favorite part of our stay was the kindness and warmth of Francoise and Patrick. They made us feel at home and did everything they could to make our stay magical. They gave us amazing recommendations and always checked in on us. 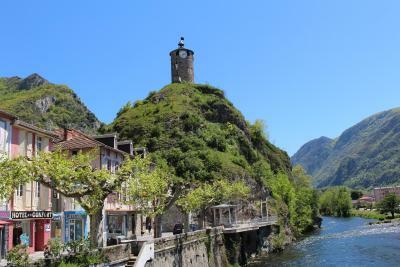 Tarascon is a gorgeous village to visit and this place is right on the water. Breakfast is served every morning and it was very cute and cozy! Definitely got our full value for what we paid, and even a bit more! Highly recommend to any travelers in the Ariege. This place is unforgettable! Georgeous town and view from room plus good restaurants in town. The hotelier might be the nicest man I've ever met. He imbued the hotel with an ambience beyond fabulouus. Hosts (Francoise and Patrick) were extremely friendly and helpful! Their english was good and they served beer/wine in the lobby and pretty courtyard until 9:30 pm. Was right by the river and easy walking around the town. Best surprise was an automated laundry right next door, open 7am to 10pm, 7 days a week. The owner and his wife were amazing, so friendly and helpful, they gave us many tips and we would highly recommend that hotel for a stay in Tarascon-sur-Ariège. Everything was close by! We would Love to come again!! Great value for money, would choose a lager room next time but cannot complain for what we paid. Breakfast good and location in town excellent. Fabulous location. Old school hotel that was charming. Friendly staff who spoke very good English. The hotel ticked all the boxes and we would stay there again. The Hotel Confort is located in the heart of the Pyrénées Ariégeoises in the historic city center of Tarascon-sur-Ariège. The hotel offers free WiFi, free parking for 5 cars and free garage for bikes and motorbikes. The comfortable guest rooms have HD TV with USB port and cable channels, direct-dial telephone and a private bathroom. Some of the rooms also have a view of the river and mountains. The Hotel Confort is on the river’s edge and is in close proximity to shops and restaurants. A buffet breakfast is served in the morning and there is also a bar with a terrace. 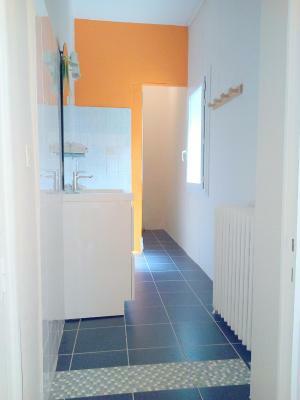 This property also has one of the top-rated locations in Tarascon-sur-Ariège! Guests are happier about it compared to other properties in the area. When would you like to stay at Hôtel Confort? 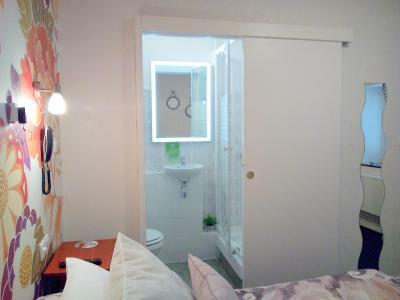 This room features an LCD TV and an private bathroom. 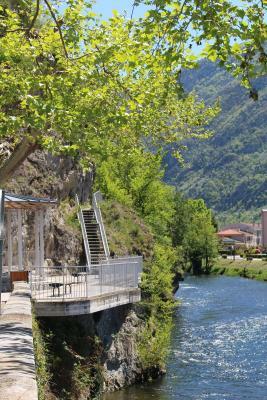 The rooms offer a view of the Ariège River and the mountains. This room has a view onto the patio. It also has a flat-screen TV. This spacious room has a patio view. House Rules Hôtel Confort takes special requests – add in the next step! Hôtel Confort accepts these cards and reserves the right to temporarily hold an amount prior to arrival. If you expect to arrive after 21:30, please inform the property in advance and call the property the day of your arrival between 16:30 and 21:30 to obtain instructions for check-in. Room smell of cigarettes. 16:30 check-in time. Location by the river. View from the room including the mountains and Tour du Castella. Helpful and friendly staff. Couldn’t find a plug socket near the bed to charge the mobiles. The owners are friendly and helpful. Location of the hotel is fantastic as we are only staying for one night. The breakfast is of good value and highly recommended. The hotel has it own secured parking free of charge. I will make sure I book a bigger room next time. Old fashioned small hotel. Nice owners, garage for motorcycles. Convenient for local restaurants. I was able to hear what the people living in the next room were saying, even if they didn't talk too loud. The room was a bit small. There was not much free space. I liked the view from the window and the location is great, just by the river in the historical part of the town. The building itself is from the 19th century. I've enjoyed talking with the owner, who is very well informed about local tourist attractions.